Birthday Express has everything you need to throw a birthday party! 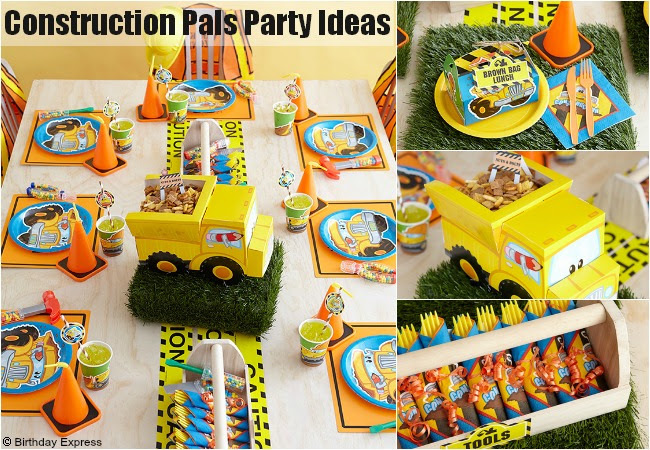 I just love this Construction Pals Party Ideas. They ship super quick, too! Whether they are building it up or tearing it down, little kids love construction, and putting together a Construction Pals themed party is an easy and fun way to build an awesome birthday. Food & Drink Ideas - Snacks loaded into the Construction Pals centerpiece and placed on top of faux grass covered foam blocks sets the stage for some delicious demolition delights. Add in some ice cream sandwich truck wheels and a loading zone of Construction Cone Cups and this is one party full of memories built to last. Party Activities - What is a construction party without a little hammering? Spray paint wooden golf tees silver to create "nails" and wrap blocks of styrofoam in wood-grain contact paper. Your little builders will love to use candy-filled hammers to whack away at their "lumber" and the hammers do double duty as a party favor. Party Decor - Your little workers will be delighted to find their very own construction vest and hard hat decorating their chair, and everyone will know to watch out for excitement when you string Caution Tape about the room. The highlight of the party will be plowing through the bulldozer piñata, and shoveling up the Construction Pals stickers, toy dump trucks and candy afterwards. For a full selection of Construction Pals party supplies, visit Birthday Express - where you can plan the perfect party from start to finish every time!